Bass is an essential part of any home audio system. We wanted to create something to give homeowners another option without impacting your living environment, which is why we developed our Trunami in-wall subwoofer. Designed to fit perfectly between two studs, which allows you to feel the big sound with high-quality bass, but cannot see where it is coming from. 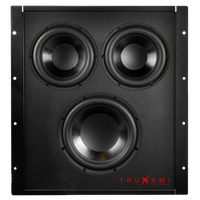 Tuned to vibrate in response to the bass energy coming from the woofer, the BAD's extend the Trunami™ bass a full -3db@32Hz when mounted mid wall near the floor. The finishing touch of our magnetic Ghost-style frameless grill features a mere 2mm reveal, and is paintable for the perfect look to blend into your decor. Trunami™ in-wall subwoofer with sealed enclosure, 8" woofer, dual 6 1/2" passive radiators, includes white paintable grill, 250 watts, 8Ω. Sold each. Amp sold separately.